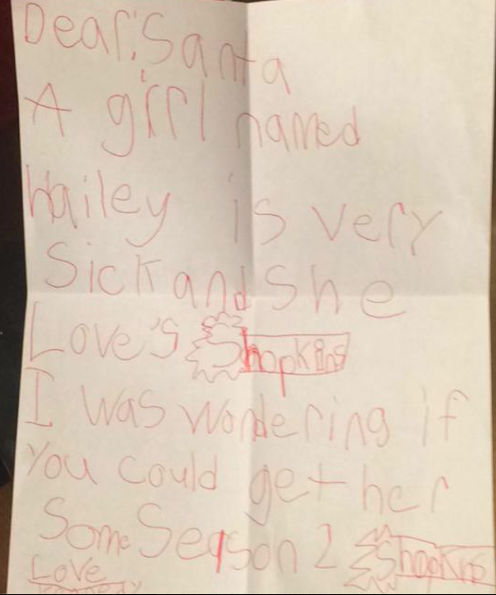 A few weeks ago I get a message on Hailey's Facebook page from a mom who wanted to let me know her daughter wrote a letter to Santa asking him to bring Hailey some Shopkins Season 2. In Las Vegas these are extremely hard to come by and it's all Hailey has been talking about. I thought this gesture was the sweetest thing to be done by one of Hailey's peers. Here is the letter to Santa that was delivered by Santa's Elf named Wink. A girl named Hailey is very sick and she loves Shopkins. I was wondering if you could get her some Season 2 Shopkins. How simply adorable is that? This little girl is thinking of Hailey and writing to Santa on her behalf. My heart swelled with happiness and my eyes were filled with tears. What a giving heart sweet Kennedy has. She is going to grow up to do wonderful things. 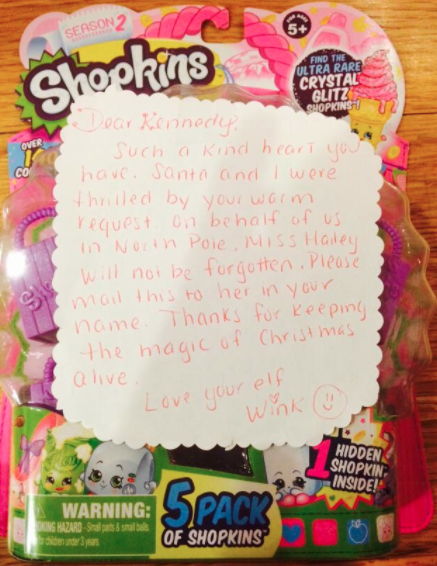 After Kennedy mailed her letter, she received a response from Santa and Wink. Such a kind heart you have. Santa and I were thrilled by your warm request. On behalf of us in the North Pole Miss Hailey will not be forgotten. Please mail this to her in your name. Thanks for keeping the magic of Christmas alive. Love your elf Wink. We received the package and put it under the tree. We can NOT wait to see the joy in Hailey's smile when she sees what has been done for her. She may not fully understand the gift as a whole but we do and we are VERY touched. Thank you Kennedy for you sweet gesture for our daughter. You will put a smile on her face for Christmas!